In contemporary behavioral disciplines, one key concept is that of ‘motivation’. Motivation is considered to be an internal energizer, something that propels us to goal–directed behavior. It is not necessary that an individual is motivated to move towards what is best suited for oneself. Throughout history, a vast majority of people were expected to work for a privileged class and unwillingly motivated to do so by coercion, manipulation or brute pressure (the lashes inflicted on erstwhile slaves, the pay–cuts that threaten the modern worker!). Psychologists go on weighing the benefits of different sorts of motivation (the lure of overtimes,‘fringe-benefits’, or the chance of being creative in hobbies, games and the work-place). It is surprising how, in spite of being burdened by such artificialities and externalities, the human being can still afford to have the motivation to dream of a perfected life, a perfected society, a perfected knowledge, a perfected love – a grand utopia of superlatives! 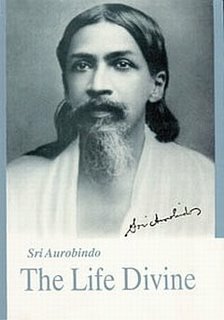 Sri Aurobindo explains that such a Utopian dream is still possible because the REAL MOTIVATOR of the human drama on earth is a primal yearning, an innate urge, an intrinsic aspiration for ‘God, Light, Freedom, Immortality’ -- a soul-call that gets rejuvenated again and again through the vicissitudes of time, the ravages of history, the phases of recoil, the turbulences of life. Indeed, the technical term ‘motivation’ in psychology sounds a bit ‘mental’, ‘cognition-linked’, whereas, Sri Aurobindo uses the term ‘aspiration’ that sounds ‘subtle’, ‘intrinsic’ ‘soul-linked’ and more in tune with a spiritual psychology. Master of all who work and rule and know, Servant of Love! A calm illumination and a flame………..
Sri Aurobindo : Collected Poems, pg. 146, 4th ed, 1986. Half-animated for a passing show…..
How do we get a solution to this existential crisis in earth itself, in the matrix of life? Traditional Christianity and Islam gave a solution out of life, in eternal heaven, provided one followed certain principles during one’s life span. In Indian spirituality, ‘heaven’ & ‘hell’ were considered to be mental formations with a relative ‘reality’ commensurate with usual mental constructs, hence different solutions had to be evoked. Shankaracharya opined that life, nay, the human drama itself was an illusion, a falsity, an unreality and the only Truth was the pure Self - The Brahman. Buddhists considered that not only the world was false, the perception that the Brahman was the sole Reality was also an illusion! For Both Shankarites and Buddhists, the solution to life’s existential crisis was ultimately to strive not to be re-born again. History had to wait for Sri Aurobindo to give a solution IN LIFE, IN EARTH and not in a faraway heaven or in birthlessness. However, he does not minimize his predecessors but acknowledges them for opening up different pathways for the soul. He himself introduces another scheme of things, a new vision, a new orientation. He explains that the Absolute (or Godhead or the fountain-head of God-Light-Freedom-Immortality) can be dynamised in terrestrial life under certain conditions. The most important condition is to acknowledge that the human being is not a finished type in evolution but a transitional being and through an evolution in consciousness, a new species, higher than the present human being can manifest in earth itself using the atavistic human frame as a base and a foundation. The saint, the sage, the seer, the inspired man of action, the creator, - these are his summits of being Beyond him is the supramental being, the spiritual superman. The main technical problem is how can the present human frame with its obvious limitations act as a template for future models of human being. Sri Aurobindo approaches this problem with two important movements. Secondly Sri Aurobindo explains that whatever is manifested at any stage in evolution must be in principle ‘involved’ in the preceding stages as a dormant principle, a ‘seed’, a potentiality (later in subsequent chapters in the Life Divine, He will explain how this process of ‘involvement’ of dormant potentialities which He termed ‘INVOLUTION’, occurs in a systematic, hierarchical and complex manner, preceding and interacting with the evolutionary movement). Thus the impulse towards life was secretly present in matter (in the orbital movements of sub–atomic particles, in the trapped energy that can be released through nuclear fission, in the reactions in the metal, in the service rendered by minerals, essential amino acids, trace elements to maintain life). Likewise, the impulse towards ‘Mind’ was present, even in a rudimentary way, in life (in building nests, hives and ant–hills, in elaborate predatory behavior, in skills of higher apes, in ‘learning’ to be racing horses, in acceptance of domesticated roles). Likewise, a ‘higher than mind consciousness’ presents to the human mind as intermittent ideas, intuitive glances, revelations and inspirations. However, up to the manifestation of the mind–principle, Nature automatically conducted the evolutionary process. With the emergence of the homosapiens, ‘evolution’ became complex as the human being is invested with a ‘will’ and ‘consciousness’. Hence for a further evolutionary growth, man’s ‘CONSCIOUS CO-OPERATION’ is needed. What can happen if the human being refuses to co-operate? What can happen if mankind loses its opportunity for progress due to its own folly? This is where Sri Aurobindo’s sadhana / Yogic pursuit has a unique contribution. He not only mapped the lines of evolutionary progression in consciousness but also, by his Yogic technology, has ‘activated’ processes whereby mankind does not miss the opportunity for further evolutionary growth. He not only provides brilliant theoretical constructs but also builds up creative matrices for their fulfillment. Actually Sri Aurobindo is hinting at an ‘evolution in consciousness’ that pari passu operates along with the biological evolution. This sounds preposterous, hence Sri Aurobindo points out that such an outrageous endeavor can only be undertaken by a ‘revolutionary individual effort or an evolutionary general progression’. (The Life Divine Pg. 6). The Revolutionary Individuals – the adventurers in consciousness (the messiahs, the prophets, the avatars, the seers, the rishis) act as torchbearers so that the general mass consciousness gets elevated for progressive growth. Sri Aurobindo’s propositions are intertwined with one very basic seed-idea that he corroborates with a matching verse from RigVeda. In the case of biological evolution, the term ‘stages’ refer to the appearance of different species, albeit in a hierarchical sequence. In the case of evolution of consciousness, the term ‘stages’ have a different connotation. Each ‘stage’ or step in evolution is actually a quantum–leap in the manifestation of consciousness, and signifies a fresh illumination, a fresh pouring of ‘God-light’, a fresh widening of horizons of knowledge. Each such stage incorporates the essence of all the past gains as well as the potentiality of all that has to come in future. Each stage is totipotent, integrative and futuristic.